This album reflects the new paths my life and my music have taken since my move to the San Francisco Bay Area. The move brought me to a rich and beautiful life with my wife Amy and my son Lev and into a wonderful community of family and friends. It also put me back in touch with two truly amazing musicians: Randy Porter, with whom I grew up in San Diego (and recorded my first record), and Akira Tana, with whom I studied as a grad student at Rutgers University. I met the talented and intuitive bassist John Wiitala on my first gig in the Bay Area, which happened to be my own wedding to Amy (with Lev listening in utero). I hope that you enjoy and are in some way touched by this music, which for me represents the convergence of so many meaningful paths in my life. Reunion is a collection of original, swinging, straight-ahead jazz deeply rooted in the Hard-Bop tradition. The Powerhouse quintet is comprised of veteran jazz players and composers with a rich history and great chemistry. Review by Brian Lynch: There is some music that brings you right in; the kind that from the first note you hear lets you know that you are going to be in for a most enjoyable and rewarding listening experience. Such is the music on this CD from the estimable fivesome that has come together here as the Powerhouse Quintet. Their music has that quality of making you want to put aside whatever else you're doing and dig their hip sounds. Brian Lynch was a member of the legendary Art Blakey and the Jazz Messengers, recording three albums with the Messengers and staying with Art until his death in 1990. He was instrumental in the formation of the acclaimed Eddie Palmieri Afro-Caribbean Jazz Octet and has recently recorded with The Phil Woods Quintet, The Toshiko Akiyoshi Orchestra, and the Artist formerly known as Prince. Brian's most recent sixth solo CD, "Spheres of Influence" made it to the top of the jazz radio charts. Our musical adventure started 25 years ago when we (Bryant, Steve, and Bim),while still in high school, discovered jazz and decided to form our own band. Having all grown up together in Del Mar, a small beach community just north of San Diego, our friendship actually goes back even farther (grade school). In August of 1978, after graduation, the three of us moved to Boston to continue our musical studies; Steve and Bryant attended the Berklee College of Music while Bim worked gigs around the Boston area. Over the years, we all continued to play professionally but went in our own directions, settling in different parts of the country. Only on the rare occasion when our travels coincided did we have the opportunity to perform together. In August of 2000, however, we were invited to play as the Del Mar All-Stars in a jazz concert series back in our home town. While Steve was still living in San Diego at the time, Bim traveled from New York and Bryant from Portland, Oregon, for the reunion. The experience was something of a revelation: despite our different paths, we found there was an uncanny empathy in our musical sensibilities, and this ignited a desire to continue performing together. 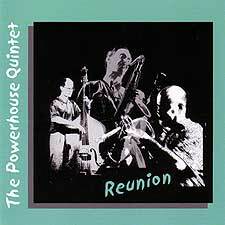 With the help of our close friend, San Diego guitarist Peter Sprague, we returned to San Diego to record our first CD as "The Powerhouse Quintet" at Spragueland Studios. Our name is taken from Powerhouse Park where we performed some of our first concerts together 25 years ago as well as our two recent reunion concerts. The music reflects our similar backgrounds which are rooted in John Coltrane, Miles Davis, Sonny Rollins, and others of that generation. We hope you enjoy our music and we look forward to many more reunions in the near future. "Bop Mambo" is a high energy collection of original and standard tunes which remains true to both the Latin and Jazz traditions, featuring some of the best musicians in the LA-SD area. 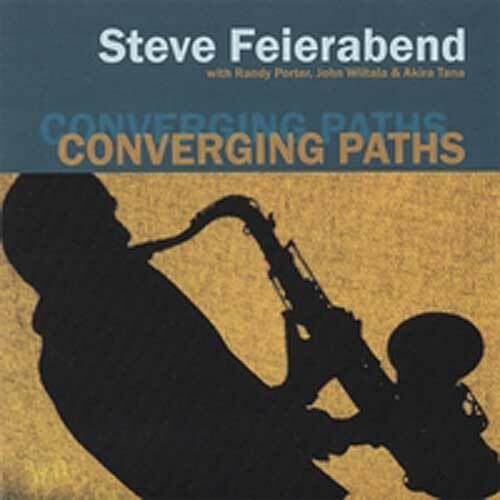 With everybody and his brother releasing Latin jazz CDs these days, it is a great pleasure to discover someone who honors both traditions, plays and writes creatively, and is smart enough to surround himself with the best musicians available - I'm talking about Steve Feierabend. There is no longer any doubt that a Latin jazz renaissance is under way on the West Coast. The torch has been passed, from Cal, Mongo, Willie, and Poncho, to the younger cats, who have given a new twist to la musica. 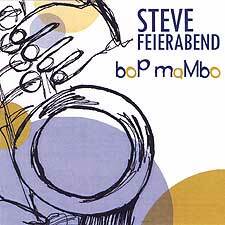 The LA-San Diego Latin jazz scene has been especially productive, as Steve's new CD displays. Living in San Francisco, I often look south with envy, at the tremendous wealth of musicians there, many of whom are featured on Steve's recording. Two of my favorite pianists, Chris Barron and Lynn Willard, shine throughout. Chris plays with the Banda Brothers, another group that is pointing the way to the future, and Lynn plays with Jack Costanzo's band. Rene Camacho, bassist extraordinaire, a regular with Susie Hansen's great band, anchors a superb rhythm section. He lists Celia Cruz, Jack Costanzo, The Pointer Sisters, and Justo Almario's groundbreaking band Tolu in his credits. He is joined by drummer Mike Holguin, from San Diego, who has played with Son Mayor, and Celia Cruz; and George Ortiz, the current timbalero for Poncho Sanchez, and a former member of Son Mayor. Gilbert Castellano is a great straight ahead trumpet player, evidenced by his work with Anthony Wilson's nonet, and the Clayton/Hamilton Band. He also has his own CD out, with a group called the B3 Quartet. 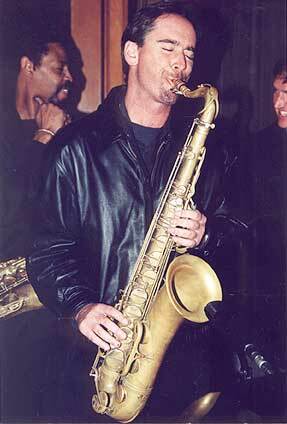 Gunnar Biggs is a veteran of Buddy Rich's band and has played with Mose Allison and Butch Lacey. Duncan Moore has recorded with Mike Wofford and Bill Cunliffe, and Tommy Aros is currently with Latin pop star Luis Miguel. I'm partial to playing standards in clave, and Steve does it just right with Lerner & Lowe's "I've Grown Accustomed To Her Face." Great solos by Steve, pianist Chris Barron, and timbalero George Ortiz. The whole track builds and burns. "The Well" is a hypnotic blend of Coltrane and Cuba. Trumpet player Gilbert Castellanos makes a fiery appearance on "Bop Mambo." "Amique" is built on an off-center, but infectious 6/8 rhythm. The CD closes with Coltrane's "Wise One." I've always felt that the last tune on a CD should be as strong as the first cut, and Steve evidently believes the same. Both he and Chris play thoughtful solos over a quiet 6/8 rhythm. Steve's credits include graduating with honors from Berklee, where he studied with the great teacher and trumpet player Herb Pomeroy, as well as graduate studies with Kenny Barron and Akira Tana at Rutgers. Steve has worked with Charles McPherson, Brian Lynch, Bill Cunliffe and many other notables in both the worlds of jazz and Latin music. Steve writes great tunes and now lives in the Bay Area. San Diego's loss, San Francisco's gain - welcome, Steve! Mark Levine is a world-class pianist, bandleader, composer, author, and educator. He was an integral part of the West Coast Latin jazz scene in its golden age of the 60's and 70's playing and recording with legends like Cal Tjader, Mongo Santamaria, and Willie Bobo as well as many others.Mark continues to be at the forefront of the Latin jazz scene with his band The Latin Tinge who have a new cd on Left Coast Clave records called "Isla". 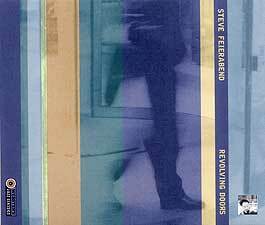 "Revolving Doors" is a thoughtful, introspective collection of creative original straight-ahead jazz. It features the best jazz musicians in the SD area as well as the great guitar playing of special guest Peter Sprague. The recording quality is beautiful as is the art design and no-jewel-case packaging.